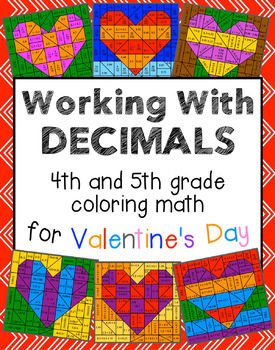 This set of pop-art Valentine's day coloring puzzles will allow students to spend some quality time working with decimal numbers while - I hope! - having a bit of fun too. 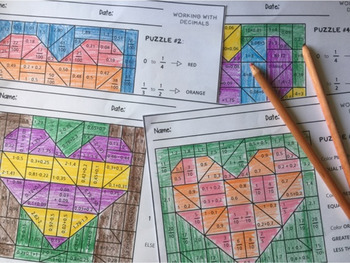 The activity can be easily differentiated to provide the appropriate challenge for each student. There are six puzzles in the set, intended as a progression toward developing number sense and familiarity with thinking in terms of decimal numbers. The level ranges from simple comparisons between fractions and numbers with one decimal digit, all the way to more challenging mental math involving the four operations. For more detailed information about the contents of each puzzle, please download the preview file. 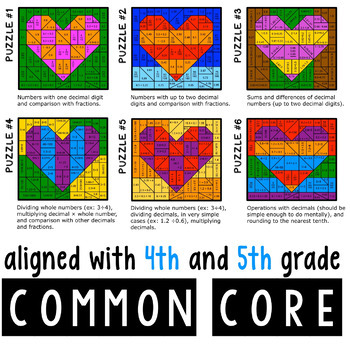 The targeted level is 4th-5th grade, as for Common Core US guidelines (or 6th grade for review and practice). Thank you for looking. 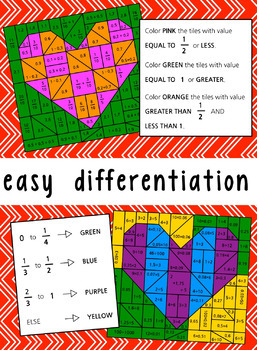 Happy Valentine's Day, and happy teaching!